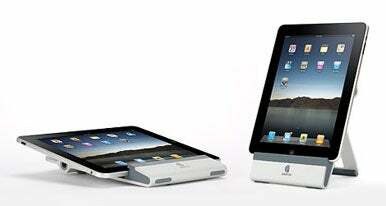 Accessory maker Griffin Technology has introduced three new products designed specifically to work with the iPad. First up is the A-Frame ($50), which looks a bit like a cross between Apple's iPad Dock and iPad Case. The A-Frame is a cradle built out of solid aluminum that can be set in an upright position (perfect for viewing movies, browsing content or using the iPad with a Bluetooth keyboard), or turned into landscape orientation, where the device will sit at a 20-degree angle from the resting surface, thus making it easier to type on the on-screen keyboard. Unlike Apple's iPad dock, however, the A-Frame keeps in mind that you will probably want to transport your device in a sleeve. Therefore, the company has devised a soft silicon grip that makes it possible to safely store the device in the cradle (and still maintain unhindered access to the dock connector) even if it is sheathed in a variety of cases. The A-Frame even folds for easy carrying while traveling and, because it's made of a lightweight metal, shouldn't add too much heft to your bag. Separately, Griffin has also announced the release of iPad-compatible models of its PowerBlock ($30) and PowerJolt ($25), two accessories which allow you to recharge the iPad from a wall outlet or a 12V power adapter—such as a car power socket—respectively. Both devices are capable of providing the 2.1A capacity required to recharge the iPad's large battery. A combined package that includes both products is also forthcoming, although there is no word on pricing yet. In addition to these three accessories, the company’s line of cases and screen kits that it announced in January are now available for sale. The entire line of Griffin accessories can be purchased from U.S. Apple Store locations, or through the company's website. Griffin's A-Frame is rock solid, and the fact that you can use it even if your iPad is inside a protective case makes the stand quite versatile. However, its range of angles is limited, and the stand's edges are surprisingly sharp.